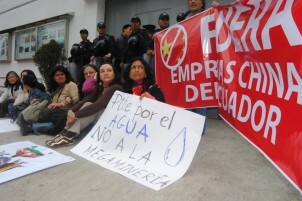 In the morning of March 5th 2012, a group of women from various Ecuadorean organizations and social groups occupied for a few hours the Chinese Embassy in Quito, to reject the signing of a mining contract between the Ecuadorean State and the Chinese company ECSA (Ecuacorriente). Outside the Embassy, there were posters that exposed the rejection of mining activities, mainly in Cordillera del Cóndor, an area in Amazonia (Shuar territory for the most part) to the south-east of Ecuador near the border with Peru. Inside the building, a request was presented to Ambassador Yuan Guisen to be transmitted to the company asking it to refrain from signing the contract that would allow large scale copper mining, something new in Ecuador. They explained that the project would trigger serious damage to watersheds, biodiversity and indigenous peoples’ ancestral territories. In addition to these impacts, there are doubts about the reputation of the company. Several reports produced by human and nature rights organizations, like this one: ‘Large scale mining in Ecuador and Human Rights abuses’, show that ECSA is involved in many cases of criminalization of the local people. Moreover, the company has failed to comply with the Ecuadorean law and other legal procedures, which demand the approval of an environment impact assessment prior to the signing of a mining contract. 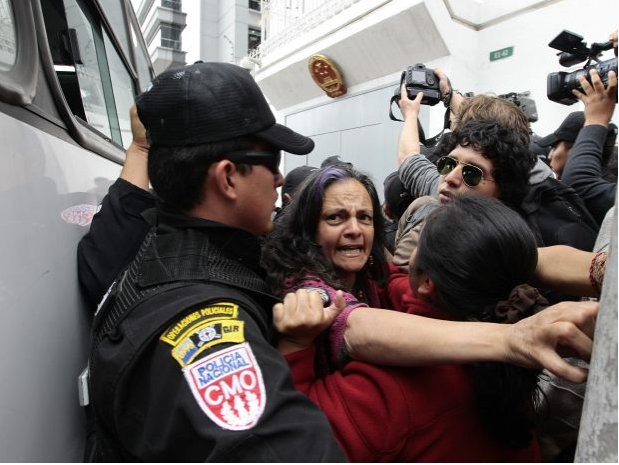 In this picture you see one of the participants of the visit to the Chinese Embassy in Quito being detained by the police when complaining against open cast copper mining in Mirador in the Cordillera del Cóndor in Amazonia: Esperanza Martinez. She is one founding member of Acción Ecológica in 1986 and of Oilwatch in 1995. and is one of the best known Latin American environmentalists. Eight women were arrested by the police and taken into custody, they were released at night time in Quito on 5th March. The banner raised by the demonstrating women said: “Fuera empresas chinas de Ecuador” or “Chinese companies out of Ecuador”. This is meant for mining and oil companies. This might have been the first time such a banner was raised in Latin-America, but it will probably not be the last.